The Illinois Department of Transportation partnered with the Union Pacific Railroad to reconstruct most of the Chicago - St. Louis Amtrak route. Similar investment is needed throughout the state. Illinois has been a leader in partnering with Amtrak and privately-owned railroads to provide valuable links between downstate communities and Chicago. Ridership has grown steadily, despite infrequent departures and out-of-date trains. We can build on this proven demand by expanding those partnerships. The goal should be to add several new lines and much more frequent service on existing lines. For example, improvements are now being completed on the Union Pacific-owned tracks between Chicago and St. Louis. The work included more than 243 miles of track reconstruction; seven new or newly renovated stations; safety improvements to more than 200 grade crossings, including new local roads; better trains control systems; and new bridges. We need similar improvements to lines currently running to Carbondale, Quincy, and Milwaukee. The state should add new routes serving Peoria, the Quad Cities, and Rockford & Galena. 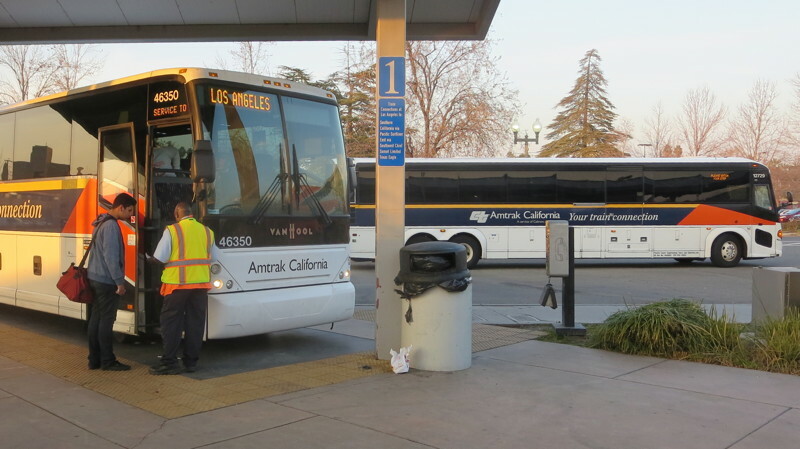 California has worked closely with private bus companies to expand bus services integrated with Amtrak. Likewise, the state should work with private companies to expand bus routes to small towns. Although it’s often overlooked by state planning agencies, bus service is a critical link to Amtrak and other transportation options for communities all across Illinois. Click here to see what routes are needed. Tell Springfield to invest in faster, more frequent and more reliable trains and buses!